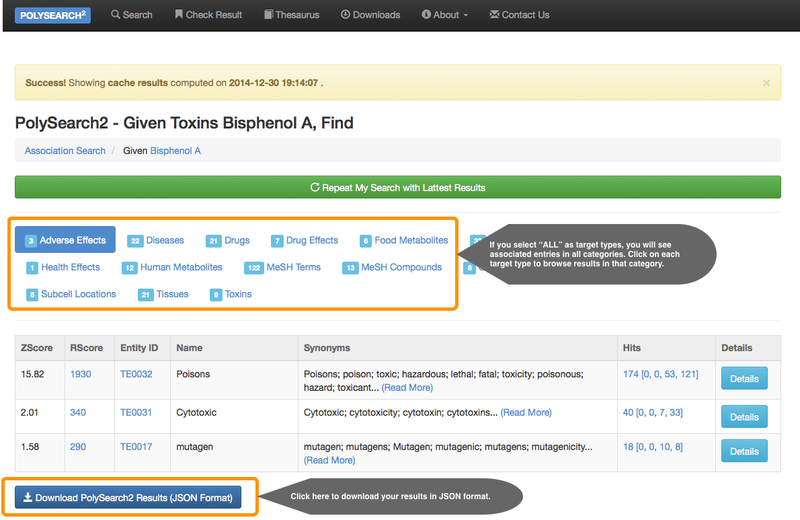 View sample results on query "Given Toxin Bisphenol A Find associated Diseases"
Quick search mines associations from the top 2000 relevant Medline abstracts. If previously computed cache result is available for your search query, PolySearch2 displays cache results almost instantly. 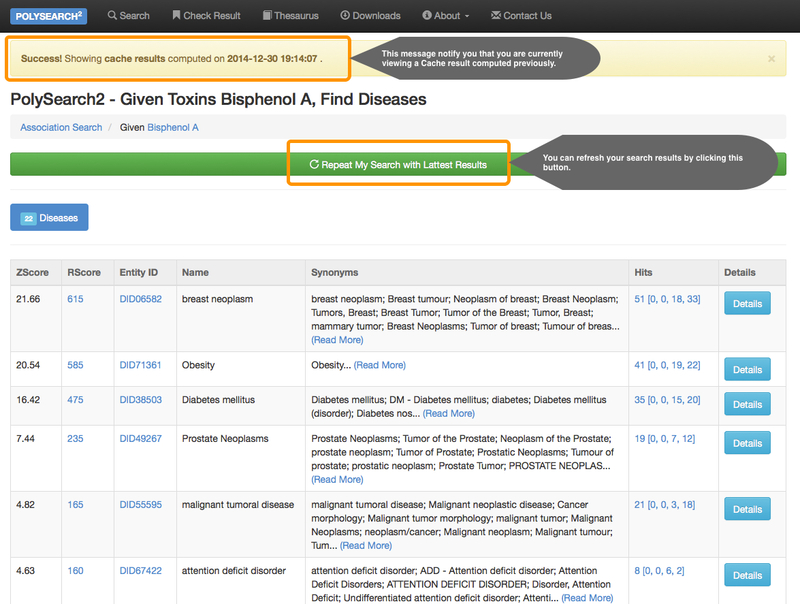 PolySearch2 also offers the option to repeat your search with latest results instead of displaying cache results. To perform a quick search on PolySearch2, 1) first choose the type of your query keyword from the “Given” pull-down menu; 2) choose the type of target terms you want to discover from the “Find ALL associated” menu; 3) Enter your query keyword in the “Query Keyword” field, 4) Press the “Quick Search” button to submit your search. Once you submit a “Quick Search” or “Advanced Search” to PolySearch2 for processing, you may be redirected to the progress page with your search ID. A “Quick Search” job usually completes in 10-30 seconds, and an “Advanced Search” job may take less or more time to complete depending on the selected document limit. The progress page automatically refreshes every 10 seconds and upon completion it redirects to your result page. You may bookmark the progress page and visit later; you may also record your search ID, which is a sequence of digits, to retreat or view your results in a later date. Once you have recorded your Search ID or bookmarked the progress page, it is safe to close the progress page and your search job will still be continued on the PolySearch2 server. PolySearch2 keeps your results on our server for at least 7 days. To retrieve your results using a Search ID, visit the “Check Result” page and enter your search ID in the “Check my result by search ID” field and click “Submit”. If your job is still in processing it redirects you to the progress page; if your job has been completed it redirects to the result page. PolySearch2 displays results in various granularity to help you better navigate between associated target entities of various types and supporting evidence. Upon completion of a search job, you will be redirected to the result overview page, where you can see a table of associated target entities (of various types if applicable). If the result displayed is not cache you should see a green message box indicating that you are currently viewing the latest results. If the result displayed in this overview page is from a previously computed cache, you should see a yellow message box indicating that you are viewing a cache result and you can click the long green “Repeat My Search with Latest Results” button to repeat your search again with latest relevant documents and analysis. You will be redirected to the progress page and redirected back to the result overview page once the computation is completed. The navigation bar below the page header shows your search ID and query keyword, as well as details on the target entity and evidence you are currently viewing. Below the navigation bar you should see result tabs with numbers indicating how many entities are found to be associated with your query keyword. Clicking on each result tab displays a tabular overview of associated entities belonging to that specific category. The overview table contains an overview on entities of a specific category. 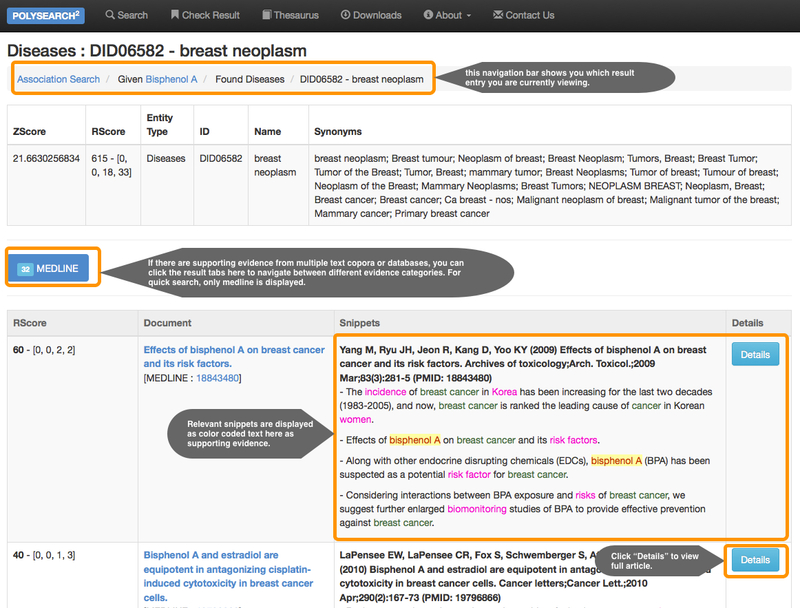 The information displayed in the table include numerical scores (normalized ZScore and raw relevancy score RScore), entity ID, name, and synonyms, the number of supporting evidence entries belonging to different level of confidence (R1-R4 sentences), and a “Detail” button linking to viewing supporting evidence on a specific associated entity. The table is initially sorted by ZScore, and clicking on a table header sorts the table in either ascending or descending order according to the selected column. At the bottom of the overview page there is a link showing “Download PolySearch2 Results” and by clicking it you can download a zipped file containing your results in JSON format. Clicking on the “Detail” button on the overview page brings you to this “Detailed Result” page. On this page we are viewing supporting evidence for a specific biomedical entity. Again the navigation bar helps you identify which entry you are currently viewing. If there are supporting evidence from multiple text copora or databases, you can click the result tabs to navigate between different evidence categories. The “Detailed Result” page also displayed evidence in a tabular format with RScores, document type, name, and title, color coded relevant snippets, and an optional “Details” button linking to color-coded full abstracts. The table is initially sorted by RScore (relevancy score), and can also be sorted by content of a specific column simply by clicking on the column header. 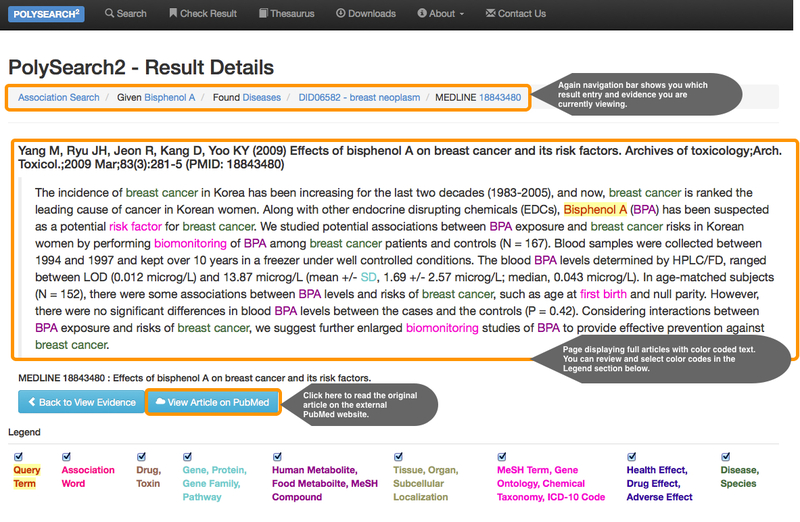 “Details” buttons on the “Detailed Result” page are only available for PubMed/Medline evidence type. Clicking on the “Detail” button on the “Detailed Result” page brings you to this “view full abstract” page with color coded full abstract of a relevant PubMed/Medline entry. Clicking on the “View Article on PubMed” button takes you to the PubMed website showing the original article. At any point during the navigation, you can go back to previous results by clicking the “back” button on your browser window or use the navigation bar for quick navigation between result entries. Advanced search gives you more options to further configure and fine-tune your search according to your text-mining needs. To perform an advanced search on PolySearch2, 1) first choose the type of your query keyword from the “Given” pull-down menu; 2) choose the type of target terms you want to discover from the “Find ALL associated” menu; 3) Enter your query keyword in the “Query Keyword” field, 4) Press the “Advanced Search” button to continue your configuration. 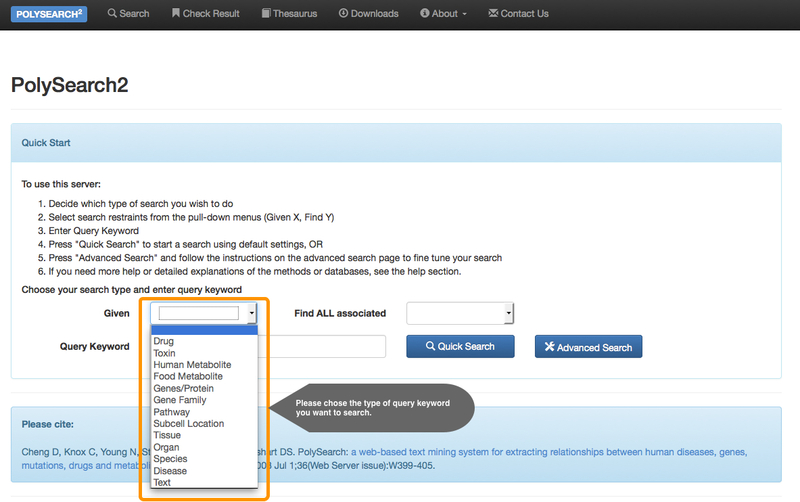 In the “Advanced Options” page, you can further configure your search before submitting it to PolySearch2. Clicking on “light bulb” icons will display tips for a specific input item. 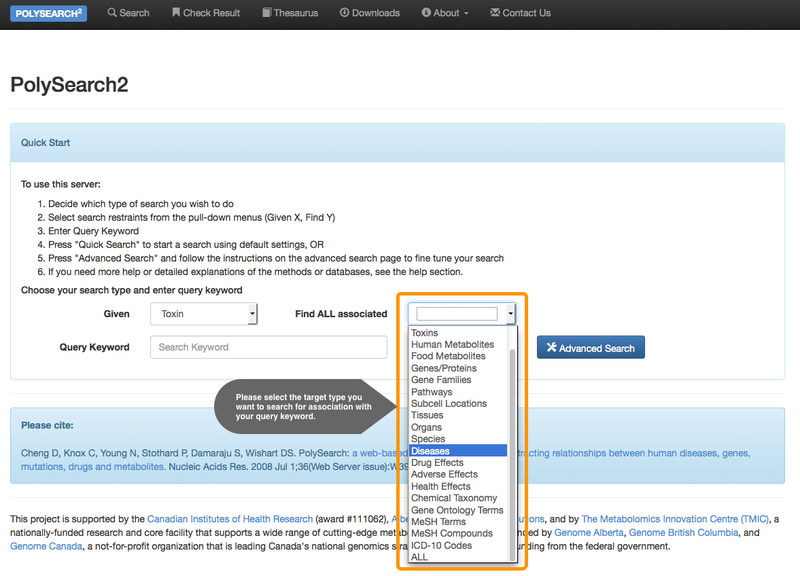 Simply configure your search and hit “Submit” to submit your search to PolySearch2 for processing. Synonym list: PolySearch2 automatically fills in synonyms for your query keyword. You may also enter your synonyms to the query keyword. All synonyms must be separated by semicolons (;). Filter words: PolySearch2 comes with a collection of system filter words for detecting strong associations. You can manually edit the system’s default filter words. Again, all filter words must be separated by semicolons (;). Negation words: PolySearch2 detect negative associations in an evidence sentence using a list of negation words or phrases. 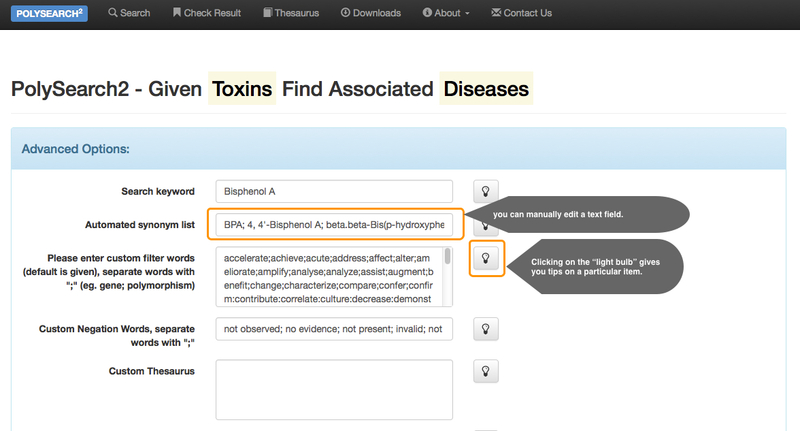 You can edit the list of negation words PolySearch2 uses for your search. Custom Thesaurus: PolySearch2 allows user to input their custom target words with synonyms to search against corpora and databases. Corpora Selection: you can select one or more corpora to search among PubMed/Medline abstracts, PubMed Central full-text article, Wikipedia full-text, USPTO Patent abstracts, selected titles from NCBI’s public accessible textbooks, and MedlinePlus. 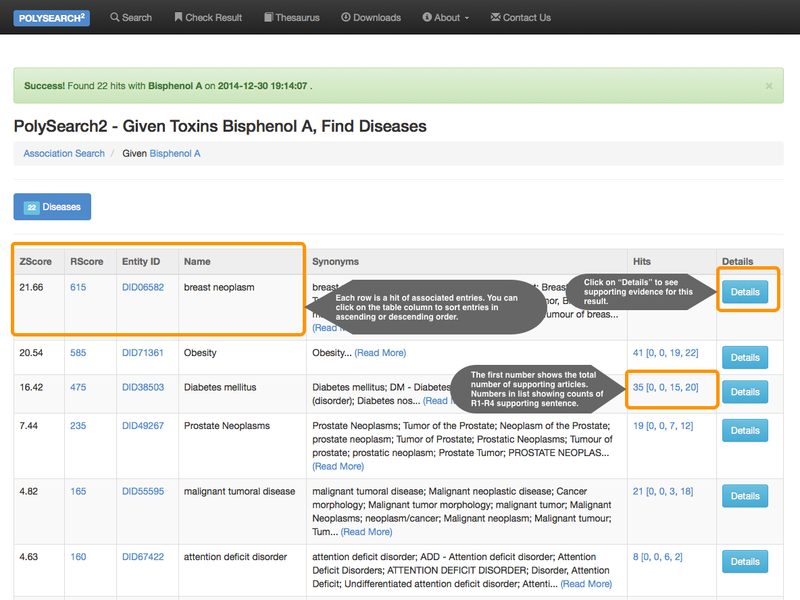 Database Selection: you can select one or more bioinformatics databases to search. The list of databases covers a wide range of biomedical entity types. For more information about the sources for all corpora and databases, please refer to the Data Source page. Document Limit: How many relevant documents (hits) PolySearch2 analyzes for association. By default 2000 documents will be analyzed and you can change the document limit to include less or more relevant documents to analyze. Email Address: You do not need to enter your email to use PolySearch2. If you want notification you can optionally supply an email address. To keep your information anonymous, your email (if supplied) is not recorded in the cache results and is not accessible to other users. Email address is used once to send result notification and then discarded. Change to any fields (except the query keyword) in the “Advanced Options” page are optional and if you leave them as default and hit “Submit”, it has the same effect of submitting a new quick search. However, unlike quick search, advanced search does not lookup previous computed cache result and will always perform new computation on your query. PolySearch2 uses a comprehensive custom thesauri containing more than 1.13 million term entries with over 2.84 million synonyms. It would be too large to browse and therefore you can search the PolySearch2 thesaurus with the terms of your interest in the page below. 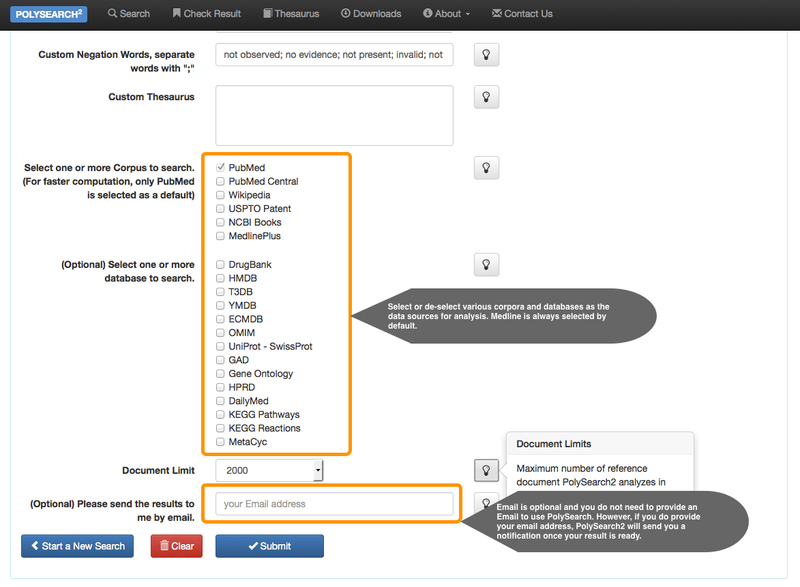 Simply fill in the text field at “Search Thesaurus” and hit the “Submit” button. A search thesaurus page will display all relevant thesaurus terms in various term categories. Clicking on "term type" tabs will show relevant thesaurus terms belong to that category. 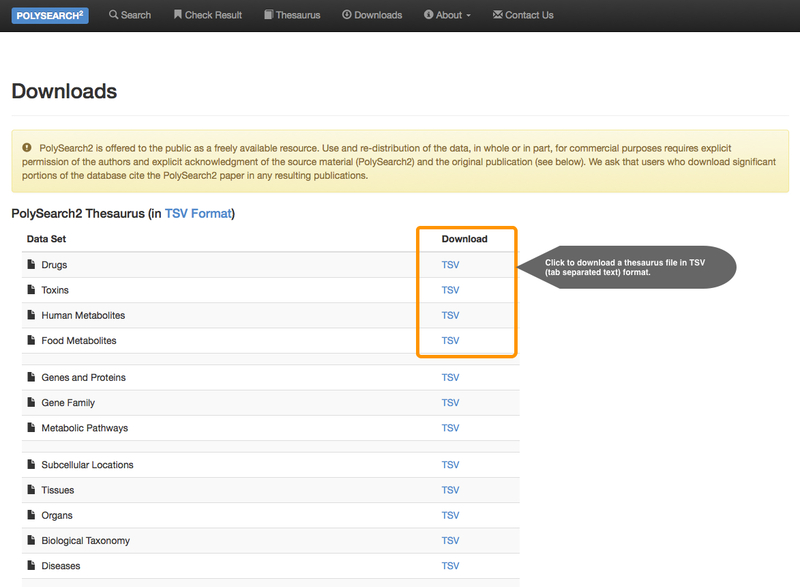 You can also download the PolySearch2 thesaurus in TSV format in the Download page. each line in the TSV file is a term entry and data fields are separated by tabs. the columns are term ID, term name, and a list of synonyms. If you have any questions or concerns please contact us here. Thank you very much for your support.